The charity’s projects transform the lives of rural communities by helping them to produce food sustainably and build a life from farming. Your £1 donation will go directly towards this. 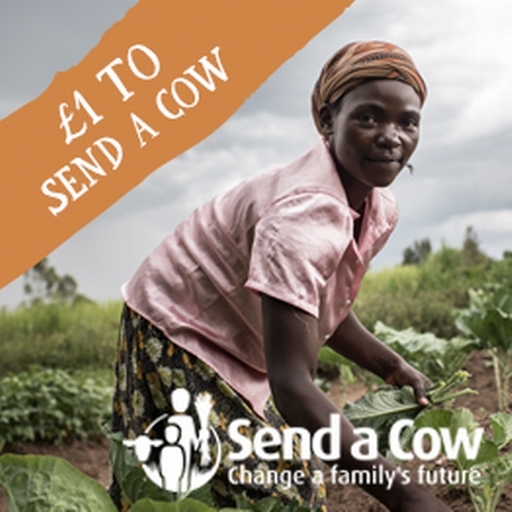 Send a Cow was set up in the 1980s by farmers in the South West to help African families and orphans grow their way out of poverty. Originally they sent surplus cows to Africa, but they don’t do this any longer. Instead, by providing livestock, seeds, training and support, they help families escape poverty for good by enabling them to grow enough food to eat and extra to sell. We have a long relationship with Send a Cow and their aims and values fit with our own. Like Riverford, they believe in good farming as the source of food, lives and communities. They work practically at a human scale and really understand the communities where they work, helping make them more resilient through their ‘pass it on’ principle. Send a Cow work patiently for sustainable solutions rather than short term fixes, giving people the tools to help themselves instead of becoming dependant on aid. We trust Send a Cow completely to make good use of the support we give. The relationship builds on our existing links with Uganda. We have personal contacts including Timothy Njakasi, who has worked at Riverford and set up the Kasengi-Riverford Training Centre; Patrick who runs an orphanage in Uganda and several other smallholders who have visited Riverford on educational projects in recent years. We have also bought vanilla from a women’s co-operative in Uganda connected to Send a Cow.